This is a new printing of the original edition on sturdy, acid-free paper of a transcription from the cantata, “La Damoiselle Élue,” or “The Blessed Damozel.” 8 pages. Highest quality guaranteed. Size of music is 9.5" x 12.5". $7.00. Achille Claude Debussy (1862–1918) became a student at the Paris Conservatory at age 10, he won the Prix de Rome in 1884, and devoted his time to composition and music criticism. In spite of his first published works being unsuccessful, he became a celebrated composer with his unconventional ideas of musical style. He composed his cantata, “La Damoiselle Élue,” for two soloists, female chorus and orchestra, between 1887-88 after his return to Paris from his time in Rome. 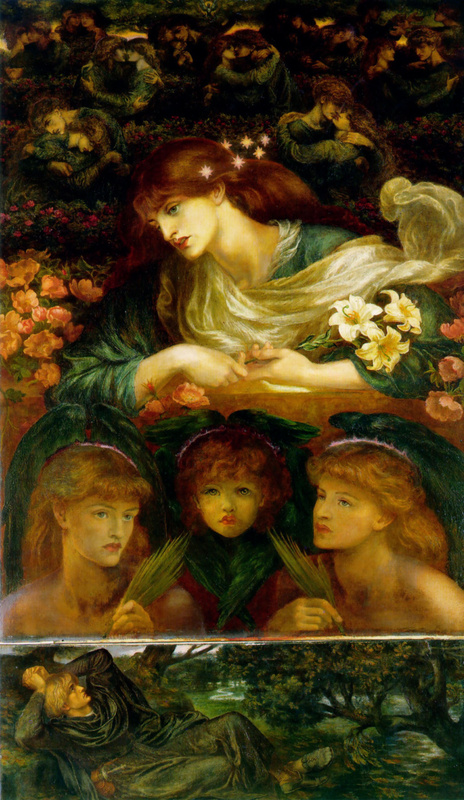 His music was inspired by a French translation of an English poem by Dante Gabriel Rossetti who wrote the first version in 1850; he painted an illustration (right) between 1875 and 1878. Palmer Christian (1885-1947) studied with Clarence Dickinson and Arthur Olaf Anderson at the American Conservatory in Chicago. From 1909 to 1910, he studied with Karl Straube at the Royal Conservatory of Music in Leipzig and from 1910 to 1911 with Alexandre Guilmant in Paris. His two Debussy transcriptions were published while he was organist (1920-22) at the Municipal Auditorium in Denver, Colorado, where he played the IV/40 Wurlitzer. Those of us from North Carolina remember his time as organist (1921-22) of the Grove Park Inn in Asheville, where he played the IV/51 E M Skinner, Opus 295, built in 1919, and at All Souls Church that had a Hutchings from 1896. He was professor of music and University Organist at the University of Michigan from 1924 until his death. Please read Marilyn Mason’s capsule biography of Palmer Christian (PDF). He was well regarded by all, but he had only the two Debussy arrangements published, this one and Debussy’s “Reverie” (coming soon). Moderate. This excellent video contains both the original French poem and an English translation.